FutureEverything (Manchester's R&D hub for digital culture)and British Council are hosting a weekend Art Lab as part of their CultureShift programme at Moscow's Strelka Institute on 27-29 September 2013. The 3-day hackathon seeks to create a space for ideas generation and exploration through rapid prototyping, creative experimentation and low risk play. The programme will culminate with a showcase of prototypes developed over the weekend and a chance for participants to win a variety of prizes, including the opportunity to show your prototype atMIGZ Festival and money to develop your project further. The event is a pioneering programme that encourages open collaboration with people who have different skills to create something original. This process is about meeting new people, learning new things and changing the way you work, prototype and develop. It is a space to innovate and be creative. There will be various activities taking place alongside the hack, including workshops and films. There will also be an opportunity for participants to use a 3D printer or makerbot, with mentors on hand if assistance is required. For more information about CultureShift Russia: Art Lab please download the attached document. Russian cultural organisations: We have asked a handful of local cultural organisations to provide their own data for this event. The cultural organisations will be releasing this data exclusively for this event and giving participants the opportunity to play and prototype with this new information. If you are interested in discussing what data you might hold and the benefits of releasing that data for Culture Shift Russia then please do get in touch with Joeli (see below). FutureEverything is an internationally recognised R&D hub for digital culture based in Manchester. They design and develop industry conferences, innovation projects, artworks and live experiences which showcase a digital future. For almost twenty years FutureEverything has been at the heart of the digital debate, inspiring thinkers, city makers, developers, coders, artists and musicians to experiment and collaborate. Their programme cross-pollinates the arts, innovation and future technology, and provide a framework for the digital art sector both in the UK and abroad.The annual FutureEverything Festival has been hailed by The Guardian as one of the top ten ideas festivals in the world. For almost twenty years FutureEverything has been at the heart of the digital debate, inspiring thinkers, city makers, developers, coders, artists and musicians to experiment and collaborate. Tom Higham - Tom is Executive Producer at FutureEverything. He will be leading and facilitating the Art Lab. Tom Schofield - UK artist, researcher and Ph.d candidate. He studies and teaches at Culture Lab in Newcastle. He also works as a freelance interaction designer and developer and frequently works with other artists as a collaborator or consultant technologist. His research interests and art practice centre around materiality in media art and design practice. Dave Mee - one of the Founders of MadLab, the UK's largest Maker-space since 2009. He teaches Arduino and facilitates hack days and creative technology projects in collaboration with other agencies around the region. The programme will commence with a chance to know the other participants over an informal drink on Friday 27 September (7-10pm). The programme will then run from 10am on Saturday 28 September until 4pm on Sunday 29. Participants will have then chance to work in teams, hear talks given by invited experts, make presentations, visit a number of workshops and watch films. They'll have the opportunity to use a 3D printer or makerbot. 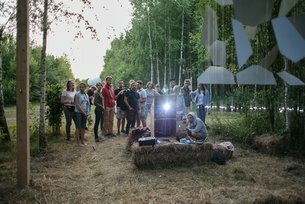 CultureShift Russia: Art Lab will be a sleep over. This is not compulsory but we strongly encourage it! There won't be beds so please bring your sleeping bags/clothes to make yourself feel more at home. Art and science exhibition Quantum Entanglement, featuring new commissions and award-winning works from UK and Russian artists, opens as part of FutureEverything Moscow.